We had folks over to see some of our photos from the Galapagos and glory in the return of our BBQ. Yay! We like having and eating with S & G. They love food as much as we do and cooking with all that Vancouver has to offer. We made a few things to snack on including D's much fanfared Salsa Verde. I have been hearing about this salsa for years and for the first two, D put off making it claiming we could not find reasonably priced Tomatillos in Vancouver. It is true. They are more expensive than California where he first made it. The rest of the time, I think he was afraid the salsa just could not live up to expectations ;^P It did. Wash and peel the husky skin/ leaves off the Tomatillos. Wash the whole Poblanos and Jalapenos. BBQ until slightly charred and the Tomatillos are slightly charred. Add the BBQd veg to the rest of the ingredients in the food processor and pulse until even textured and as fine as you like. I also made the BBQd Roasted Baba Ganoush we have made a few times on this blog. It is super simple and super EASY on the BBQ. The most difficult or rather annoying bit about making it is how long it takes to roast the Eggplant in the oven. They are done in a flash in the BBQ. One thing I will call out from this recipe is that I think the Eggplants we used this time were slightly larger or more starchy. I had to add more acid. I did not want to use another Lemon but you could or should have. I simply added another 2 T of white Vinegar. Chop 1 T of the Dill, Chives and 1/2 cup of Basil. In a bowl, mix the slightly softened butter thoroughly with a rubber spatula as you would fold cake batter but perhaps with a bit more gusto as it will be stiffer of course. Cut a few slits down the sides, on both sides of the outside of the Salmon. Stuff a slices of Lemon and Basil in each of the slits with the handle of a butter knife or other dull wide implement. Place all the other herbs and remaing Lemon inside of the fish and head. Smear the entire fish with the Herbed Butter. Reserve 1/3 of the Butter for serving. Tie the Salmon closed at four points along the length like you are wrapping a butcher's package. I suggested to D that we buy one of those Grill Baskets in the shape of a fish that hold a whole fish together and allow for easy flipping. He would not hear of it. I am going to buy it anyway. We always make a mess on the flip. Carefully place the fish on the grill and grill for 10 to 12 minutes. Do not touch it or move it slightly as tempted as you may be. It will tear the skin if you do. It will be easier to move once it has cooked. Use a large wide Fish spatula or two spatulas to turn the Salmon. Turn over for 10 minutes more. Ours was still quite ruby in the middle but that is the way we like it. You may want to go to 12 and 12. We also checked with a thermometer before pulling it off. 130F can be acceptable if you are confident in the source. 135-140 is normal by most fish monger standards. Over 150 you are getting close to catfood. In a large mixing bowl, place the Cous Cous and pour over the Boiled Broth. Cover and set aside for 15 - 20 minutes. Fluff with a fork. Add the Lemon Juice, Salt, Herbs and Oil and toss thoroughly. Steam the Edamame Beans until done, 2-3 minutes. Rinse under cold water. Drain thoroughly. Toss into Cous Cous. Cover and set aside until needed. Perfectly fluffy and tasty cous cous. D got this recipe from a restaurant in Whistler. He was there for work and everyone at dinner liked the cake so much that D asked for the recipe. The chef wrote it down on a piece of wax paper. D does not remember the name of the restaurant. How odd is that? There are not that many up there that would serve this cake. Anyhoo. It turned out a bit differently than he remembered and there are a couple of things I would tweek to make it extra scrumptious but I have transcribed it here as it was given to us and exactly as D did it except 1 thing. We used 1 pan. I highly recommend you use 2. Oh, one other thing, I added the instruction that you should drain the Oranges. Oddly, the assumption was made but if you look at the liquid in the rest of the recipe, it is the correct choice. We were stressed there for a bit. I wanted to reduce the boiling liquid as a syrup but D wanted to go straight up for the first try. Booo! Trim the ends off the Oranges and cut into quarters. In a medium pot, blanche aka dump in enough boiling water to cover for 15 seconds. Remove and refresh water three times. In the same pot, add 1 c Sugar (additional to the above) to 4 c Water and 1 split Vanilla pod with the Oranges and simmer for 15 minutes. Drain and cool Oranges. When cool, pulse in a food processor until chopped evenly but chunky. Add the rest of the ingredients listed above. Run the processor for 45 - 60 seconds. Pour the batter into 2 greased, round cake tins. Bake for 35 - 40 minutes. Test that a wooden toothpick or skewer comes out of the centre clean. (crumbs are okay but not batter). When D first had this, everyone at the table though it was cornbread. It is rich and delicate. It will not be fluffy. Very orangey. Yum. Our friend J was visiting with his three, THREE very very energetic small children. The last time they visited I made the daring decision to make a Vegan Lasagna without telling them that I it had Broccoli let alone Soy ground round. They ate it up and the only thing they balked at was the Spinach Salad. Well, you can't win them all. This time J brought his own kid's dinner. They had been visiting their Grandmother on Vancouver island and she had packed them some Lasagna and Quiche for the kids. So I just needed to take care of dinner for J, D and I. We knew it would be easiest and most fun to BBQ. J would be pretty tired from the drive from the island and a full day at the Vancouver Aquarium and D and I were coming from work. I stopped at Whole Foods to pick up our favourite Salmon burgers and bought my veg from the supermarket across the street because Whole Foods may stack the vegetables in lovely colourful and uniform pyramids but you pay a pretty premium for the service. So I crossed the street. It wasn't like I had to move or repark the car. I don't drive. Mix all the ingredients in a bowl and let souse for at least half an hour. To 'de-cob' the Corn is easier than it may seam. Stand the cob of Corn and hold the 'handle'. Hold firmly and, using a sharp chef knife, run the knife down the length as close to the core as you feel comfortable going. Turn a few degrees and continue. We also BBQd some Sweet Potatoes, a couple more Corn on the Cob and warmed up the Multigrain Kaiser rolls. It was a lovely summer meal. The kids tried to watch Madagascar while we ate. I was fine after a few hours but I was definitely too full for dinner. I had a bit of Salad and leftovers so D took the opportunity to eat meat. He defrosted one of the frozen meal sized packets of Kalbi my mom sent home with us. He was happy. Mom goes out of her way to buy the best cuts of meat and of course, went the extra distance knowing she was making it for D.
I could not get out of diving today. I would have had to cancel with enough time for them to try to resell that day but even that is against their policy. She could see by the greeness of my palour that it was in both our best interest she try for the third day. One interesting note is that if you are on a Tour Boat, you cannot Dive. It is illegal. You cannot snorkel the dive sites either. It is too dangerous. On the flip side, if you are on a Dive Boat, you cannot go ashore. The guides are not certified or permitted to go on shore. We visited Seymour on our cruise but a different part and the water was much calmer. Seymour was only a 20 minute speedboat ride and I was better prepared with the dramamine so it was a 20 dollar day at most (see my motion sickness game from yesterday). It was a challenging dive for me. I am a relative newbie but D is Advanced and Rescue certified. He assured me that I could handle it so I trusted him. I was a bit nervous from some of the discussion on how strong the current in the area can be. There were areas during the dive where we were literally, climbing from rock to rock against the current to move. As professional as Scuba Iguana was, that was something they could have better prepared us for. Our dive master rather assumed that we all knew what was coming. We had the junior of the two and he was very attentive so I was okay. I was rather annoyed that the more senior dive master took a much smaller group because he let his brother in law and nephew tag along next to us on a Zodiac and then he led them all day. Nice. 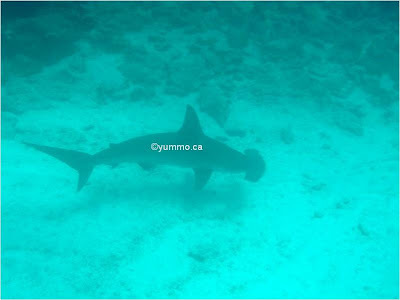 So we saw a few sharks and lots of turtles but for me it was the experience of navigating that current. We had a lady on the boat who bailed out of the dive as soon as she dove in. She had said she'd actually been diving for 20 years or so we were rather surprised. And as I said, since JC of Scuba Iguana had taken a smaller team so he could let his brother-in-law and nephew tag along gratis, we were stuck waiting on the bottom for 15 minutes while she had to be fished out by the boat. Not impressed. After that exhausting day as well as the day we had planned for tomorrow, I wanted a hefty meal. I was so pleased that I was able to each lunch on the boat and all. I recall staring at everyone eating yesterday and being so envious that they could even look at their food. We chose the Rock on the main road. I chose it mainly because it had Wifi and I wanted to upload photos. The Wifi sucked. We were at the window and I could not get coverage. Oh well, we at least got in there just time for their 2 for 1 Mojito special. They were strong! Or I was tired! 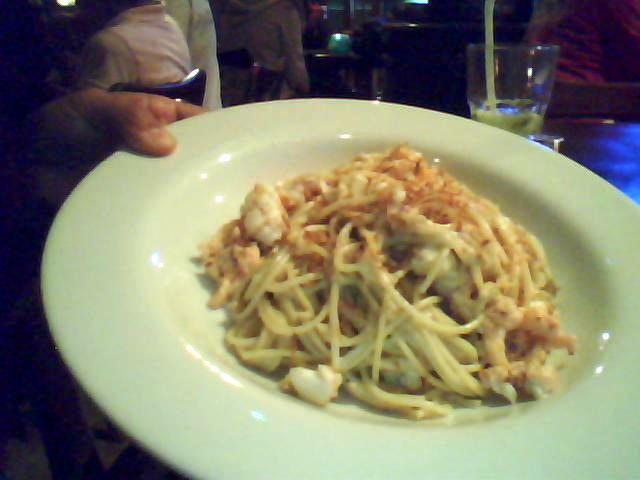 I had the Linguini with Galapagos Lobster with a Coconut sauce. I ordered it for the belly full of starch and the intrigue. It was very good but it was a bit cloying by the end since the sauce was a tad on the dry side and continued to dry out. Still, I enjoyed it. D got a mixed grill with every possible mean under the sun. Overall, the food was well prepared though some of the meat too well done and presented. The drinks were well made. The service was excructiatingly slow and the prices on the high side for the area. The place is clean and modern and you can read about the history of how Baltra and the area came to be called the Rock on their place mats. I had forgotten my camera in the hotel so I took them with the webcam on my netbook. All these places offer Wifi and some of them work so no one is surprised or put off by the presence of laptops.. Drinks: Specials nightly only applies to 2-3 drinks and beer. I know what your thinking. It is July. Why is she making a warm, heavy pasta for July. Well, we just got back from a pretty long holiday which you will see me continue to write about. There are several of our regular comfort foods that I had to do without. A good hearty Vegetarian Bolognese is one of them. I'll admit that while eating it, even in the cool Vancouver evening, I did rethink the plan. 1 packet 400 g Potato Gnocchi. Yes we use either fresh from the Deli or vacuum packed. We have made Gnocchi in the past and it is alot of work. I love Gnocchi and if I had to restrict my consumption of it to the days I actually made it, well, that would be sadness. Vegan Bolognese is pretty easy. You can mix up the veg you like in it but I like to try to keep certain flavours and textures in so that meat eaters do not feel deprived. Key to the texture issue, aside from the Soy mince substitute, are Mushrooms. In a large Skillet, heat 1 T of the Olive oil and 1 T Butter. Add the Mushrooms. Spread out as much as you can. Do not touch for a good minute to allow browning. If you move too soon, they'll just steam and get soggy. Move around and then let sit for a minute. Add 1 T Olive Oil. Add the Onions and Zucchini. Sautee for 2-3 minutes until the Onions are soft and slightly browned. Add the Garlic and let cook for 1 minute. Do not brown. Just get the edge off. Add the Red Wine and scrape the sugary goodness of the brown stuff aka Fond that has accumulated on the pan. Add the Soy Ground Round and break up. You could add it before the Red Wine. It is already cooked so it is not as important. It will also absorb liquid. Add the Herbs. Add the Tomato, Paste and Water. Stir and reduce to a low simmer. Allow to simmer for 10-15 minutes. Serve over Gnocchi with Fresh Parmesan. We had an Artazuri Garnacha 2008. It was nice with the food. It is not a snuggle with a glass alone wine. This was are last day on the boat. We had a Zodiac boat ride through the Mangrove rich area called Black Turtle Cove. We saw a number of Rays, Sharks and Turtles as well as birds out for the food. Tutu - aka Francisco - our Chef! I finally took a picture of Tutu and his magical little kitchen. I have him my Canada bucket hat with my Blog website inside. I hope he visits the site to see how much we enjoyed his food. Breakfast before we left was Scrambled eggs. Tutu made me separate scrambled eggs since the others had Bacon in his eggs. The rest of the group went to Baltra to catch their flight out. Originally we were meant to end in Puerto Ayora so this threw us a bit. We had to make our own way to the town. A taxi from the Airport to town should only cost you 15$ and they will help you with your bags onto the shuttle to the ferry. You can take the bus to town which will only cost you 2$ per person but they leave on scheduled departures so you can wait up to half an hour and they will only drop you either at the main dock or if your hotel is enroute. We decided it was worth the extra $. The ferry is only 80c per person. Oddly enough, it was only 75c on the way back. We were staying at the Casa Natura. D booked it on line. It was rather expensive and not at all worth the price and that is not on South American scale. It was as expensive as a 3*-4* in North America but probably 2*. Most nicer places on Santa Cruz will run you higher than Quito. There are hostels and small motel type places that are much much cheaper but you will have to book them on arrival. Some places will charge you more for hot water in room. If you are diving, you will want a warm shower. We had lunch at Cafe Hernan in town on the boardwalk. We wanted somewhere that had big screens to watch the World Cup. 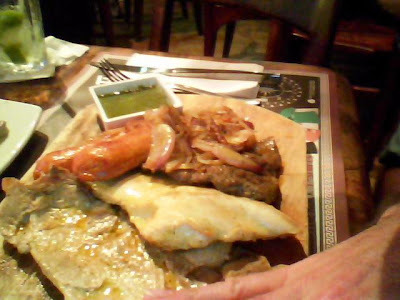 Most places on the main strip had pizza on the menu but Cafe Hernan but alot of them have frozen crusts. Cafe Hernan had fresh dough and were oven baked in a proper baking oven. I had a Tuna and Green Pepper Pizza. I washed it back with a Mora berry Juice. D had a Cubano Burger. It is a cheese burger with a fried egg. It was reasonably priced and there were big screens everywhere. The place was packed and looked quite popular. In the main port area in Puerto Ayora, there is a large nightly gathering to play Ecuadorean Volley. The net is about 3 ft higher han a standard volleyball net and the allowed 'touches' are slightly different. I saw alot of directing and palming. But that is not really the biggest different. I discovered that it is a very competitive sport and betting is standard. Where monthly salaries are in the hundred's, it is not uncommon to bet upto 60$ on a match. The players that come out are often well known and if you are recognised as a strong player you are assigned a handicap. I saw one guy only allowed to play with one hand and yet another allowed only lift. Very interesting. Someone told me that even when children or high school students play, they will bet a few dollars as well. All shapes and sizes played and they played hard! Mondays are painful. The first Monday after a holiday is diabolical. Days like this are perfect for throwing random food on the BBQ. We grilled some Green Onions and Yellow Zucchini after tossing them with Olive Oil and Salt and Pepper. I made a quick Cous Cous. As I was going through my holiday photos, I came across a rice that Tutu made on the boat where he added tiny noodles to a rice dish. So I added some to the Cous Cous for texture. I did not fry them as he did so it was not the same but it was tastey. I also added some fresh Dill to echo the Salmon. 150 g Salmon per person is usually sufficient. We sometimes go more. Mix the Dill, Oil and Sugar in a small bowl. Spread on the flesh slide of the Salmon only. Make sure the Salmon is clean, boned and dry first. Pepper. You can sprinkle with Salt but only just before the Grill. You do not want to draw out moisture from the Fish too soon. Grill skin side down for 3-5 minutes depending on how thick it is. We like it a little ruby in the middle and not over cooked. Flip if you are adept with a whole filet. You could use a BBQ Fish Basket specially designed for grilling fish . It will break up a bit. I don't always flip. If you have the lid down, it will get cooked through and most of the cooking will happen on Skin Side. D flipped it for 2 minutes. The Vegetables will only take a few minutes so time your grilling. We sliced the Zucchini lengthwise. Yummo! Along the beach on Rabida, there were several of these little Fiddler crabs. Our guides drew a square in the sand and raced them. We saw the etchings in the sand from the previous group. I am guessing this is a regular source of tourist entertainment. I had thought I had taken breakfast photos all along but now that I look back on the photos and my notes, I realise that I did not have my sea legs the first few days and was not physically fit enough in the mornings for photography. We had something different each day on the boat. We always had fresh fruit, toast and cereal along with the plato fuerte. Lunch started with a nice cream of mushroom soup. July was the start of the dry season but that did not mean that it was warm everyday. When it was overcast, it was quite cool and so the soup was welcome warmth. Tutu made the rice in a large round form but the chafing dish really did not support it so it sort of fell in. Too bad, it was pretty. We just served it on the counter instead. The sides today were unusual. We wondered if it were an common sort of Ecuadorean side. There was a platter entirely of preserved, jarred vegetables: Asparagus, Mushrooms and Green Beans. There were Salads and Cheese as well. Dessert was a nice light sort of .... well, we could not figure it out but it was definitely Pineapple on the bottom. The top of the dessert seemed like a cross between Meringue and Flan. It was not too sweet and had a nice smooth texture. I have a new favourite Ecuadorean food as of this day. After our morning visit, Tutu made us a snack called Pan de Yuca or Yuca/Cassava Bread with a Honey dip. It was YUMMMMMO! It has a very mild yet sturdy cheese in the centre that made it nice and chewy without oozing. I could not tell at first if it were cheese or the chewiness of the bread. It was SOOOOOO GOOOD! We saw something today that I had been looking forward to for the whole trip. We had seen Marine Iguanas on several islands by the dozens and dozens lying sprawled on the beach. Up until today, we had not seen them swim. On the beach here on Egas, there were swimming in the little tide pools as they munched on the moss and algae growing on the rocks. Our last dinner on the boat started with a sort of Caprese Salad with a Soft Cheese with Tomatos with Shallots in Balsamic. There were sides of Roasted Potatoes, Broad Bean sautee and salads. 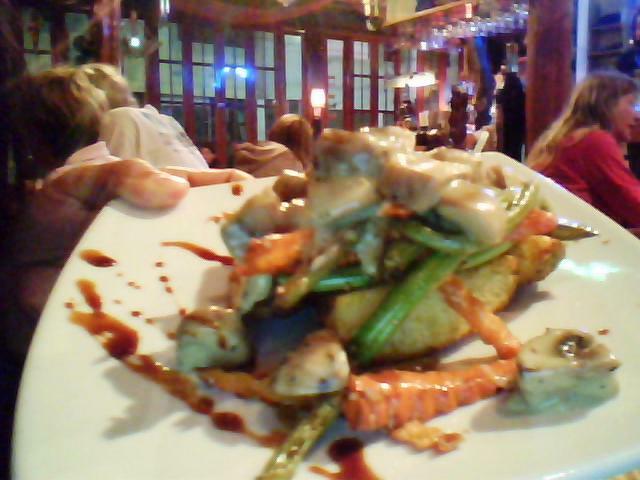 I had pan fried Fish and D had a kind of Meatloaf. Two desserts today! Dessert for dinner was a Caramel Flan. The use of those green cherries was pretty frequent and superfluous. The pudding was delicious. We visited a fantastic island today. Bartolomé island is one of the younger islands and though the volcanic activity is thousands of years past, the craters and lava flow speak volumes. The views were spectacular and the snorkelling magical. Breakfast varied day to day but always had yogurt, cereal and fruit. The mains were omlettes, fried eggs, and today was French Toast with Syrup. Light and fluffy. Yum. Gino our guide mentioned that Tutu was planning something special for us. Tutu prepared an Ecuadorian lunch which started with a gorgeous Ceviche. Ecuadorian Ceviche is different from Peruvian or Mexican in that is served wet as a soup. Sometimes they will come with vegetables like Tomatoes and Onions. It was delicious and I had my eye on the bowl of B sitting next to me who was eating slower :^P. The main was full of signature Ecuadorian dishes. We had a light Avocado salad. I am not certain that there are differences in Avocados there but they were lighter and fluffier. There was rice, Mote (Hominy) and Fried Bananas. Of course there was also Llapingachos, potato and cheese cakes. There was a hot sauce and a peanut sauce too. Everything was delicious. Everyone else also had Horneada or roasted meat. Tutu of course made me some fish but I was pretty stuffed with Avocado Salad and Llapingachos. Dessert was a Fruit Salad served in Juice. I think it was Guanabana Juice. It definitely had the creamy fruity characteristics of it. Guanabana is often served as a fresh juice here. It is also known as Sour Sop or Durian. I am guessing that Wahoo is a very affordable fish. It is very versatile, that's for sure. I had it most days but I did not mind. Tutu went out of his way to do it differently as often as possible and as I have said, his other dishes often filled me up before the fish. Tonight he also had done Green Beans wrapped in Bacon but he made a small portion for me and another vegetarian with Cheese. Even the snacks between snorkelling like pizza had a small cheese side. There was a couple of girls who would not respect that even after polishing off the pepperoni and they were often gone before we got any. Nice. This ain't an all you can eat buffet! It's a boat. Dessert was very special. There was an American couple travelling for their 45th Anniversary! Isn't that amazing? They were sweet though we were rather surprised they were on an adventure boat. The cake was frosted with a Blue and Pink icing on each side. The staff made sure that all the boys had blue pieces and the girls had pink. Though I was stuffed to the gills, I finished the whole velvety chocolatey piece. Since it was D and my honeymoon, we considered it good luck to eat it.